Does your dog fear the vacuum cleaner? Does he run to hide under your bed when you move furniture around? Does he bark frantically at the Christmas tree each December? If so, there's a good chance that your dog has developed a fear of specific objects. Dogs can develop a phobia or fear of a specific object for a variety of reasons. In many cases, it's just that the dog gets frightened of something unfamiliar. The Christmas tree is a good example of this. Your dog isn't able to understand your reasons for decorating for the holidays. All he can see is a big tree full of lights and shiny objects where there had never been a tree before. Dogs can also become fearful of certain objects because of the unpredictable noises they make. Toby, a hound mix, stands and barks at a child's stuffed animal that sings a birthday song. He keeps low to the floor with his ears tucked back as he barks, ready to run if the stuffed animal should lunge at him. The unfamiliar and unpredictable noise startles him to the point that he has developed a fear of the stuffed animal. Many people see this type of fear develop in their dogs towards the vacuum cleaner, hair dryers, and other noisy household items. A negative experience with an object can also cause a dog to become fearful. For instance, if you accidentally run over your dog's paw with the vacuum cleaner, the pain he feels can cause a fear of the vacuum cleaner. With some objects, you are able to simply hide them out of your dog's sight. If it is something your dog won't often encounter, you may be able to just avoid his exposure to the object entirely. For instance, Toby's fear of the stuffed animal is easy to deal with because the toy can be stored in a closet out of his line of sight. A mild fear may be eradicated simply by giving your dog some treats anytime he approaches the object. Try to ignore your dog when he gets a little closer to the object. Just gently toss some treats over with each step he takes. If this doesn't work, you can try leaving treats on the ground that lead up to the object. Allow your dog to get the treats in his own time, and again, try to ignore him as he investigates the area around the object. You can leave a few treats around the object every day, and your dog will soon learn that he gets good things whenever he goes near the object. It may take a little more work to get rid of a more severe fear. With some objects, you may need to slowly get your dog comfortable with it. This works well with fear of objects like the vacuum cleaner. You can start by leaving the vacuum in the middle of the room without turning it on. As in the previous step, you can leave treats in the vicinity of the vacuum. It may take several days or more for your dog to get comfortable with getting close to the object. After the dog is walking around the vacuum without fear, you can try turning it on for just a few seconds while continuously tossing some really yummy treats to your dog. Slowly build up the amount of time the vacuum is on until your dog is able to get close to it without succumbing to fear. The final step is to begin moving the vacuum cleaner. Keep the vacuum turned off when you begin this process. Move the vacuum around the room a little, and toss some treats to your dog. Gradually work up to moving the vacuum around while it is turned on. 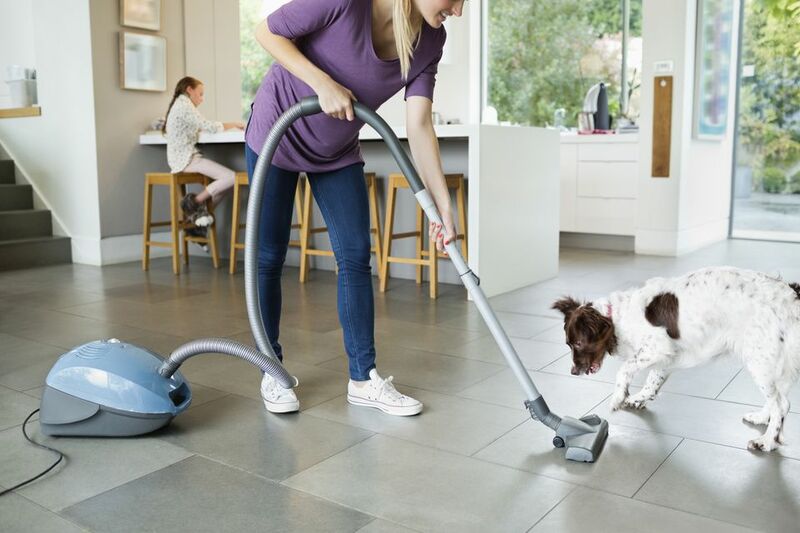 Soon you should be able to vacuum the whole house without a whimper from your dog.